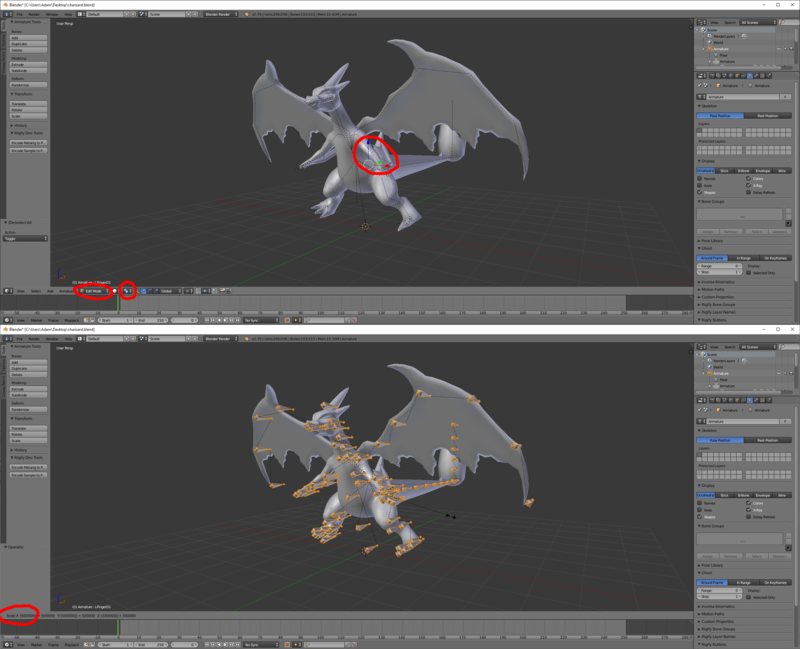 I have imported a free model of Mega Charizard Y from a 'models resource' website. The imported model says that it has bones, but when I go into pose mode, I cannot move the bones around. They also look different than bones I have seen in tutorials, so I am really confused. I want to be able to 3D print the model, and want to pose him into a much more dramatic action sort of pose. Any help with this would be great please! What you can see are the relation lines, not the bones. For some reason your bones are so tiny, you can't see them. Select the armature, go to edit mode, select Individual Origins for Pivot point, then hit "a" to select everything. (If you selected everything the Gizmo must be appear in the middle of the skeleton). Then hit "s" to scale and type in a big number (500,000). Then hit enter or left click and go back to pose mode.